Each year, St. Stephen School honors an alum who continues to dedicate time and commitment to our school, parish, and surrounding community. Our honoree is chosen from recommendations made by members of the faculty, staff, and administration who have observed this alum’s acts of service first-hand. 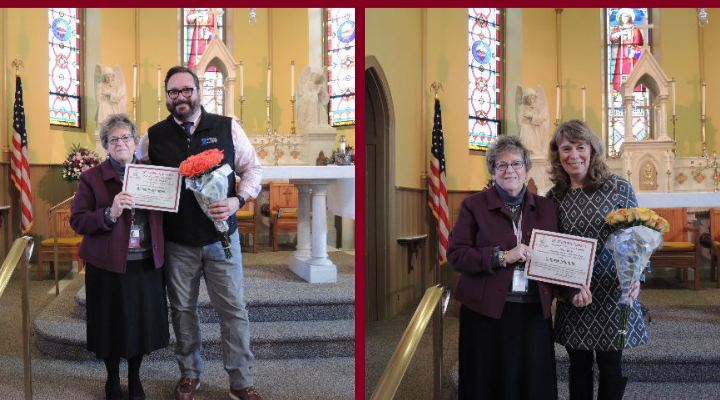 It is a school tradition to announce the winner of this award during Catholic Schools Week, a celebration of Catholic education and the values it instills in all those who seek it. This year, the faculty, staff, and administration of St. Stephen School are proud to present this award to Robert Brockmeyer. Rob Brockmeyer is a member of the class of 1984. After graduating from St. Stephen, he continued to pursue his Catholic education at The John Carroll School before heading to Towson University. He now works as the Senior Director of Creative Services at WMAR-TV 2. When he is not overseeing the production of digital and broadcast creative, Rob takes the time to give back to his former grade school and his parish. He was integral in placing a weatherbug camera at the school. He is quick to share news of grant opportunities with the school and has even secured several for our boy scouts. He has also provided thoughtful insight to the betterment of the Church as a member of the Parish Council. When it came to choosing a school for their children, Rob and his wife—our very own Mrs. Laura Brockmeyer—could think of nowhere better than St. Stephen School. As a parent of two St. Stephen Alums himself, Rob has spent his fair share of time chaperoning dances and working as a member of the Father’s Club. He has even been spotted helping out at the cake and pit beef stands at the St. Stephen Carnival. Rob’s involvement and service is not just confined to our school and parish; it extends well into our surrounding community. He has helped, volunteered, or participated with events and organizations like the Turkey Bowl, Dogfest, Festival for the Animals, Relay for Life, Race for the Cure, the House of Ruth. A person is measured not only by the things that they say but by the things that they do. Rob Brockmeyer’s commitment to service and dedication to our school, parish, and community speak volumes for him. He exemplifies all the values that our Catholic education enforces though his service to others, and we are proud to have him as our recipient of the 2018-2019 Alumni Award. After much consideration and deep conversation, St. Stephen School was able to select one of its many talented teachers for nomination. We are pleased to announce the St. Stephen School Teacher of the Year for the 2018-2019 school year is Mrs. Deborah Mirabile. Deborah Mirabile is the product (and the proof of success!) of Catholic education. She attended Catholic school from kindergarten all the way through her undergraduate degree. After graduating from Mount St. Mary’s, Deborah went to work in Wall Street law. But, there was always something missing; there was always a tiny voice in the back of her head calling her for something more. After getting married, moving, and having her children, Deborah went back to school to pursue a teaching career. She found her way to St. Stephen School, and the rest is history. For the past 13 years, St. Stephen has been privileged to have Deborah Mirabile as our kindergarten teacher. Deborah is dedicated to educating students in an environment that surrounds them with Catholic values. She educates the whole child, sharing her faith enthusiastically and instilling in each student her love of God. She makes sure every child in her class feels encouraged and loved. She is a role model of her Catholic values as she treats her colleagues, parents, and students with the utmost kindness and respect. She is an engaging, enthusiastic, and knowledgeable teacher. She uses quality questions and discussion techniques to spark student participation. Deborah is keenly attuned to the learning strengths and differences of each child in her classroom. She is flexible and able to adjust and change her lessons (sometimes on the fly) to enhance learning and/or to differentiate instruction for better understanding. Her focus is always on providing what each particular student needs in order to facilitate their best learning. She is an asset to our school, her peers, her students, and her parents. There is absolutely no doubt that she has greatly impacted the lives of every student she has taught. God’s work is clearly evident in all that she does. We are truly blessed to have her.